I’ve been dying to meet Jennie for some time. Here she finally is in her cute vintage apron! 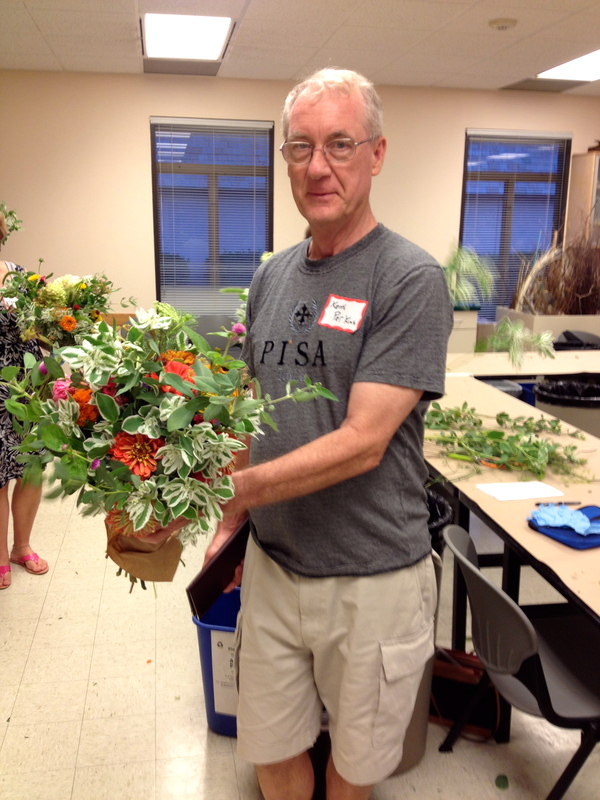 I’m holding the hand-tied bouquet I made in class. 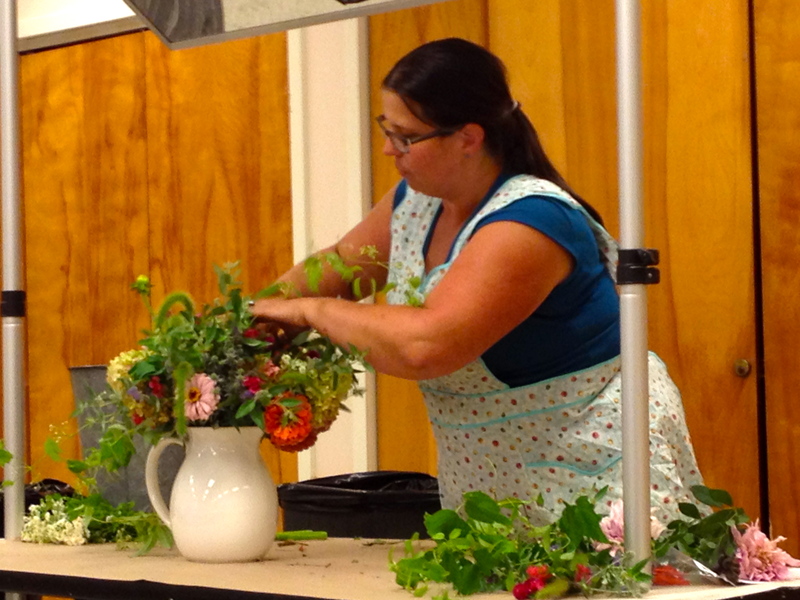 Today, she is our teacher for a Floral Fun class at Longwood Gardens, where we’ll be creating a hand-tied bouquet; and she should feel right at home here because Jennie got her training in both growing and floral design at Longwood. Why create a hand-tied bouquet? They are very fast to make, they eliminate the need for carcinogenic floral foam, and they’re lovely in their loose, organic, country garden feel. 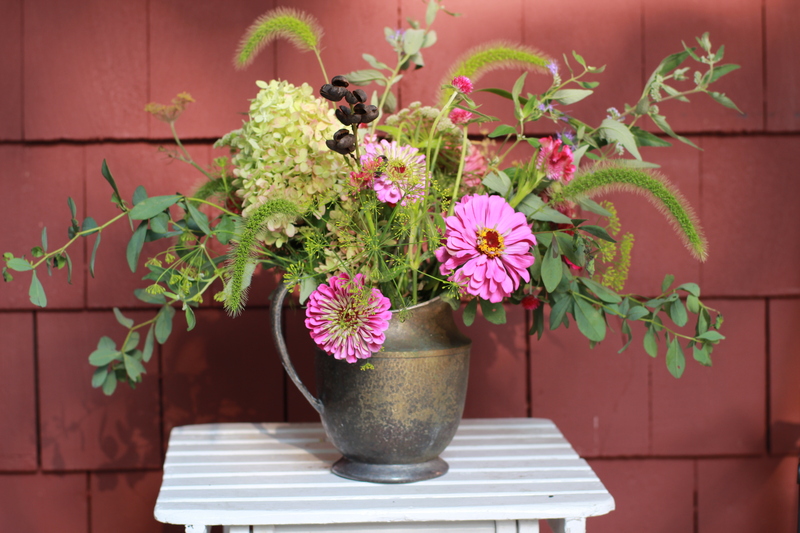 They make a great simple gift, too, and it’s easy to create one out of the flowers right from your own garden, especially when you have great plants to work with and a teacher like Jennie to show you how. 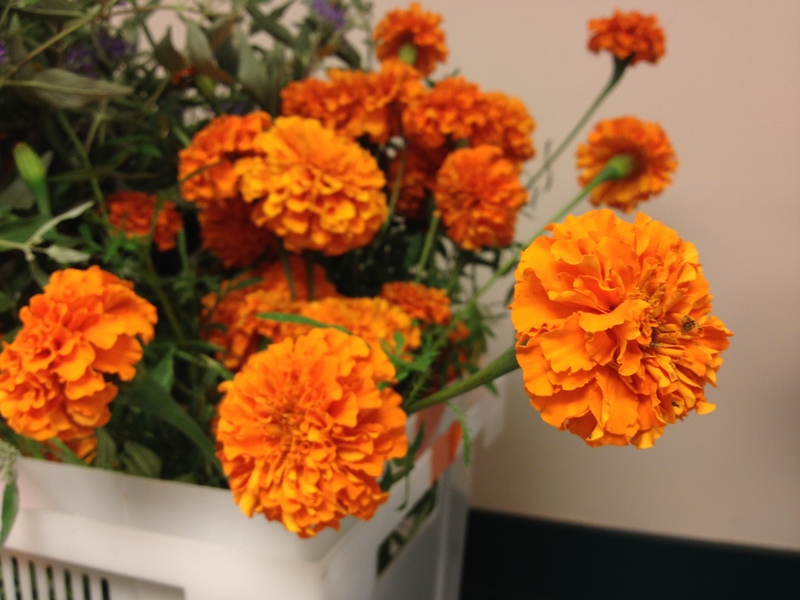 Jennie has brought freshly harvested materials from her farm, and as you can see, these flowers are vibrating with health and beauty. 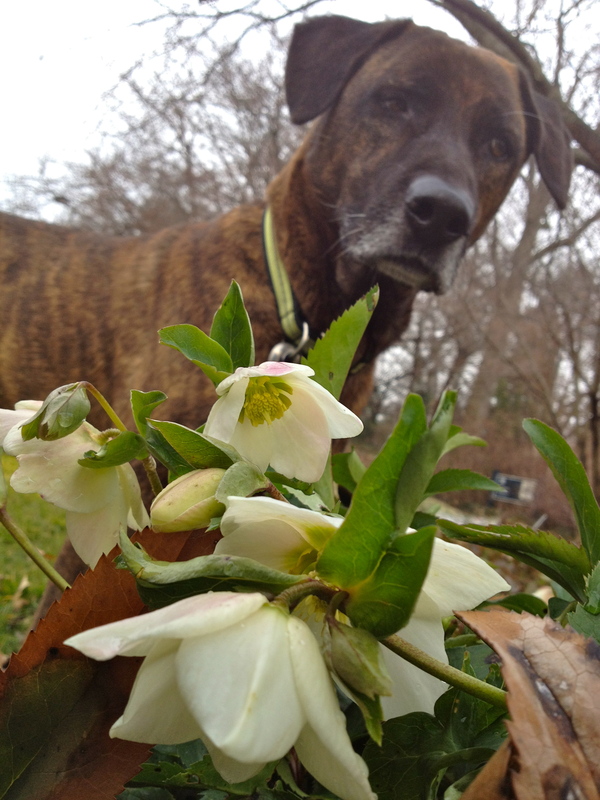 She has two acres in the Roxborough section of Philly, where everything is grown organically – no chemical ever touches her sweet blooms. “But watch out for bugs and spiders,” she warns. Dill ‘Bouquet’ – grows extra big flower heads – I love this! 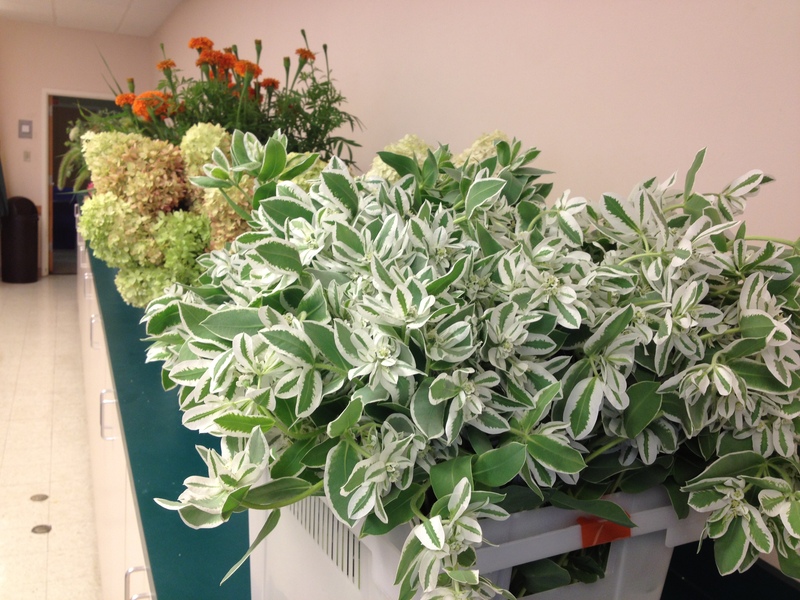 Snow-on-the-Mountain, or Euphorbia marginata, emits a milky sap that when cut can cause dermatitis. We are given gloves in case we want to work with this – so gorgeous! We begin by stripping the leaves and side stems off of all our materials, and making neat, organized piles of each material. To start the hand-tied bouquet, Jennie recommends taking foliage/flower that will create the inner column – in this case we use hydrangea. The first set of stems is to be kept straight, but as you add to your hand-tied, you should be constantly turning the whole bouquet and then adding your sets of stems at an angle, and it will eventually look like a spiral of stems, beautiful. We hold the stems in a relaxed manner in our non-dominant hands, pinching the index or middle finger and thumb together loosely to keep our angles intact. As you build your hand-tied bouquet, keep turning and adding stems at an angle. As you build bigger, the angles will get more dramatic! After the first set of stems, add sets of stems to develop texture and contrast. A zinnia or two here, some filler flower or foliage there. 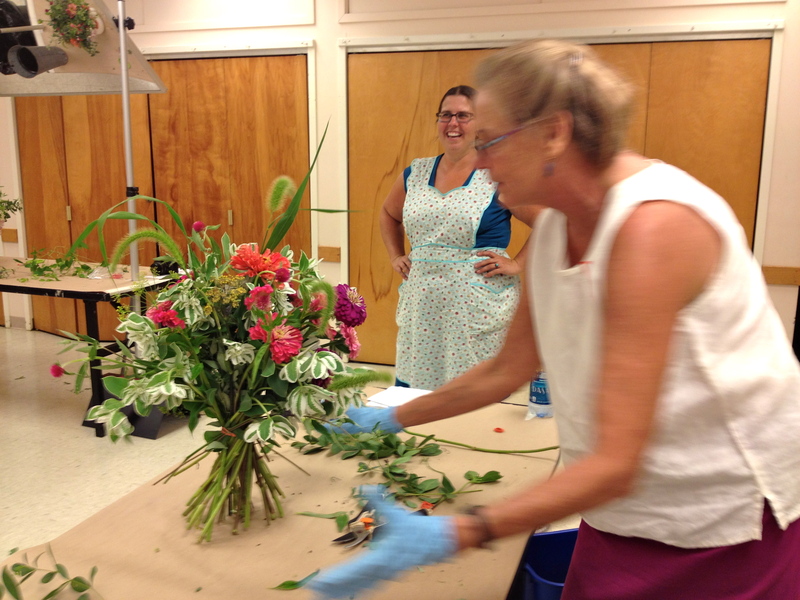 Do a 1/4 turn after each set of stems to create fullness and a balanced design. 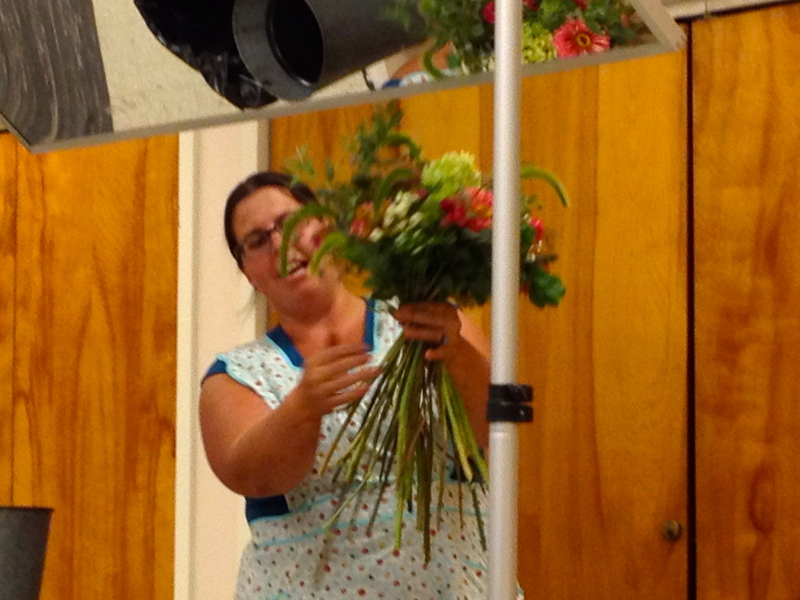 Here, Jennie apologizes for sounding like a hippy, as she advises us to really just “let the flowers speak to you.” You can add things to the center by dropping them down into the bouquet if you feel it needs more of something. “Don’t be afraid to get wild,” she imparts, adding her foxtail grass which erupts in green flame from the bouquet, which is growing ever larger, fuller, and more beautiful by the minute. Yes, she makes it look easy. That’s because hand-tieds are the bulk of what she does. She does many, many weddings (I think she said she’s already done 72 in this year alone?!) 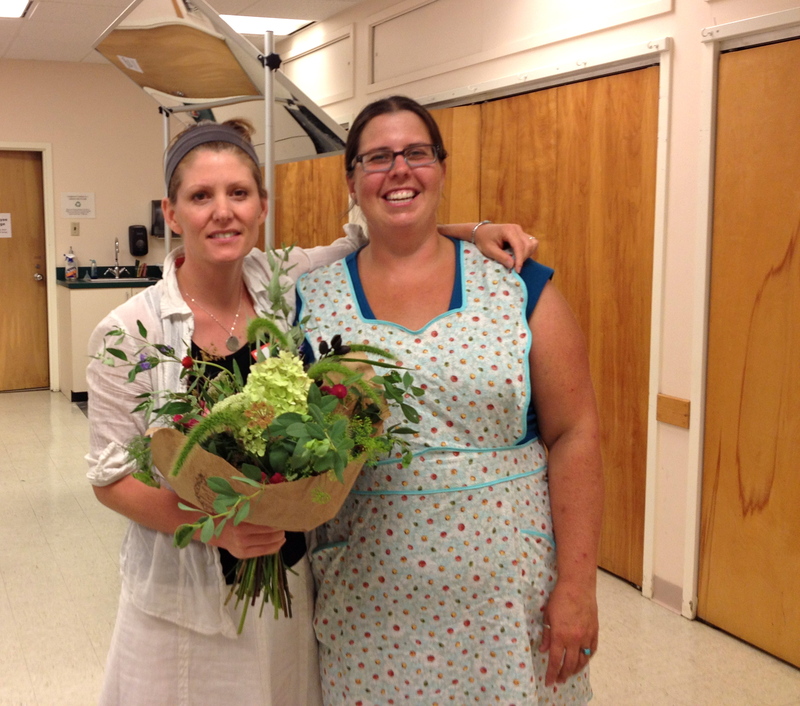 and these bouquets are central to her work. She’s developed the hand strength to whip right through them, and her eye guides the design as she goes. 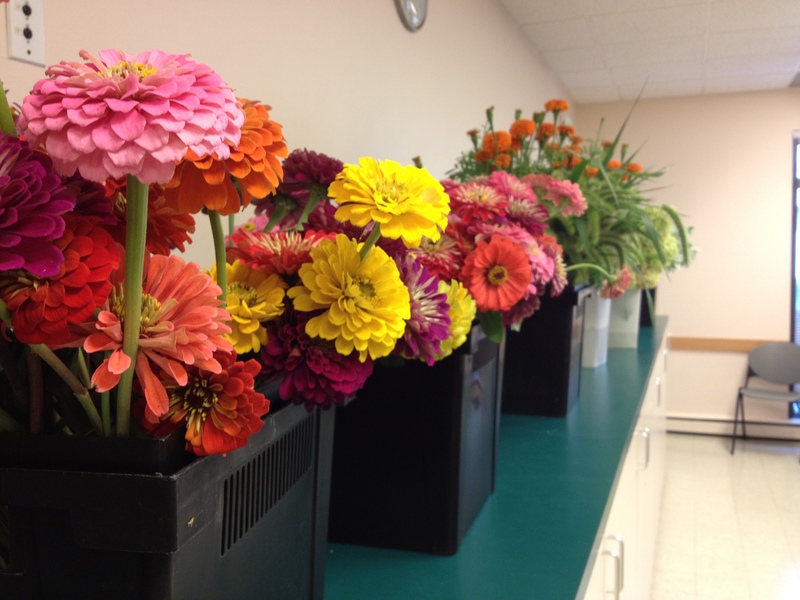 Hand tied bouquets look good in round mouthed containers. No square vases please. Then, when you’re all done, take the rubber band you have cleverly put around your wrist and work it around your stems. Cut stems evenly and at the height you want – measure against your container before you cut, and leave a bit longer so you can always cut more. Once inside the container, you can fuss and let things breathe a bit. So, how did we do? Julie’s design is gorgeous and sits upright on it’s own after completion! Balance is perfection! Kevin had no problem with his design, great job! The next morning, I find a container for mine and a little patch of morning light to set it in. Thanks, Jennie Love. I really enjoyed meeting you! And I feel really good about this Philly-grown bouquet – no packaging, no shipping, no floral foam – spread the love!